In the 80's, Tom Petty did a Quentin Tarantino by pulling some of his heroes out of the mothballs and reviving their careers. Tarantino did it with Pam Grier, John Travolta and Robert Forster. Petty revived the careers of Del Shannon ("Runaway"), Roy Orbison and Dwight Twilley. Twilley was a die-hard rock and roll fundamentalist from Tulsa who believed in a few simple chords, a ridiculously catchy melody, thumping electric guitar notes, and plenty o'slapback reverb. Along with his buddy, drummer Phil Seymour, they had one huge classic hit, "I'm On Fire," and unfortunately fell victim to record company runarounds and rejections, so he was unable to follow-up his initial success. Seymour split and had a one-hit solo career around "Precious To Me." 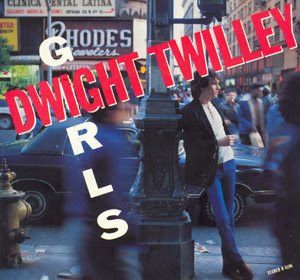 Finally in 1984, after being tossed around record labels and finally landing on EMI America, Twilley, along with his amazing lead guitarist Bill Pitcock IV, put out his second big hit single, "Girls." Ironically following the musical blueprint he created several years before that, Petty's endorsement of his friend and contributing background vocals finally put Twilley back on the well-deserved map. Yes, it's got about three chords, an insane guitar hook matched by the one-syllable chorus ("Girls! "), and just about nothing in common with the big-sounding artists of the day like Phil Collins, Wham, Van Halen and Duran Duran. That was Twilley's last roll through the Top 40. Since then,he's put out a number of fine independent albums (including a couple of cover collections), and compilations of unreleased material. Two fun videos below. The first, the official 80's style video, seemingly modeled on Van Halen's "Hot For Teacher," where it's all frisky babe cheerleaders with big hair cascading through the gym locker. The second, the required appearance on weekly music TV show "Solid Gold," all rolled up jacket sleeves, lip-synched away, while Tom Petty's distinct nasal background vocals drift over the audio.